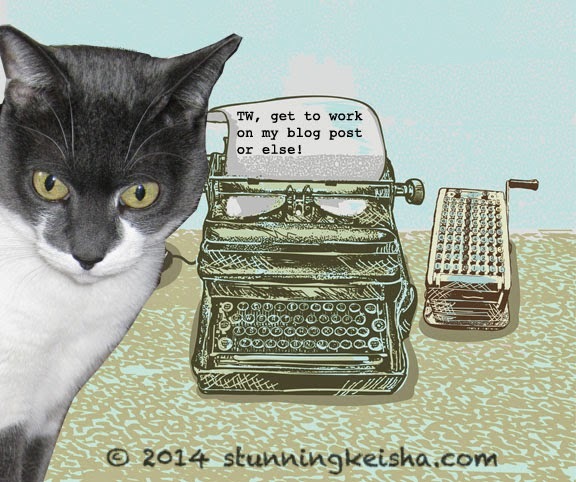 A couple of weeks ago, Ann from Pawsitively Pets invited me to join a virtual blog tour where bloggers share their writing processes and techniques. In a weak moment, we agreed and were supposed to have fulfilled our side of the bargain a few weeks ago. I like Ann’s blog cos she has these cool rats for pets. OK, she also has a woofie—a pit bull woofie, Shiner, who I don’t want any trouble with if you know what I mean. I still got my street smarts and know who and who not to do battle with. I also like that she was a vet tech and provides some inneresting info although sometimes it can be a bit deep for me. Usually, I understand those posts better than TW. Yep, I like Ann but I kinda wish that she’d let me win one of her giveaways. Here are the three questions she wants me to answer truthfully—in fact, I had to put my paw on a stack of Fancy Feast cans and do some swearing. Biting TW, at the moment. Nothing. Absolutely nothing. Well, actually, I’m going to have an exciting giveaway which will hopefully coincide with my 5th Blogoversary in September. I’ve also received some cat food as prizes that I’m going to try to review so that the companies will consider letting me work on their campaigns in the future. A cat’s gotta eat and free food goes down so much easier. Of course, I’m always posing for photos like the lead to this post so that you can ooh and aah over my stunningness, which seems to grow stronger every day. Yep, that’s moi. 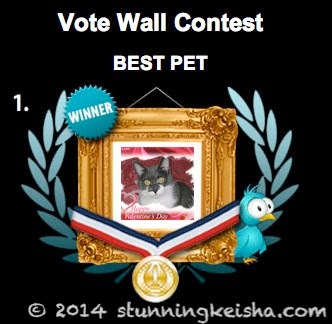 Best Twitter Pet. Why not? TW lost her job a couple of decades ago. One day we were reading a story in a local free paper about Sockington. We looked at each other and said “we can do that!” We built up a following on Twitter and then started the blog. Let me sing you this song to the tune of So You Wanna Be a Rocknroll Star about why I do what I do and how I got where I am. And hope that The Woman doesn’t let you down. Cos they gonna force a Google+ account down on you. with videos to make the humans swoon. I work TW a million times harder than any boss to get my blog done. For this, I’d like to share a cartoon that was in the paper yesterday. Due to copyright rules, I can only give you the url. I’m going to give you a moment to go over and look at Pearls Before Swine, which totally describes TW’s writing process. Hope you found that funnier than I did. When I finally get her to focus, she does the writing first cos she likes writing. Sometimes I’ll have several ideas what I’d like to write about for the week; other times we have no idea. We don’t write or plan our posts in advance. The one time TW wrote down an idea for a post, she had no idea the next morning what she was thinking. We do have some drafts which may or may not ever get finished. We use stuff that happens during the day or has happened recently as our topics. 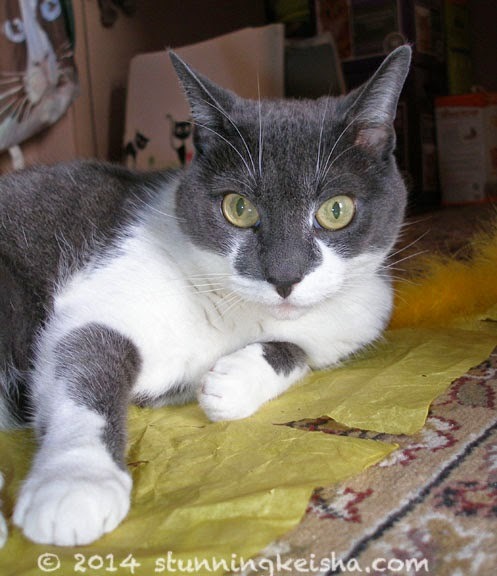 The blog after all is about a stunning cat’s observations of day to day life with her humans. It’s not unusual for us to finish a post about an hour before it’s due to go live. The only exceptions are paid campaigns which we start working on the moment we get the info and have figured out a way to take it so that it’s in my voice. The art is the last part. Many times the posts are based on a photo shoot that I’ve recently posed for. Other times we use file photos. I’m supposed to invite three other bloggers to join in. I’m gonna nominate two and hope they would like to take part. 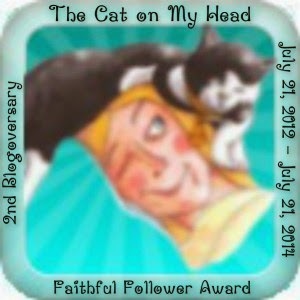 In a perfect world, I’d nominate Janet Blue and The Cat On My Head blog. Lily Olivia, Mauricio, Misty May, Giulietta, Fiona, Astrid, Lisbeth and Calista Jo always make me smile. I’d also nominate Jenna from Love is Being Owned By a Husky cos huskies are dogs I also don’t wanna mess with. I’m not sure if they’ve already been part of the virtual blog tour or not cos TW is senile. I’m sure Mika, Lexus and Koda would be very gentle with me and I hope I would be polite also if we ever met. I hope I haven’t bored you too much. Let’s see, it’s now 10:10 and this post will be up in two hours. Good job, TW! Pffftttt! Now see, this was super interesting. We love your blog, CK. All that kind of stuff never happens around here because the Human seems to think that whatever I have to say better be able to be said in three or four sentences, or even better one or two. She says nobody wants to hear *me* blather on. As if! Pearls Before Swine is my favorite comic strip. I will admit to a similar writing process. Goat butts are amazing motivators. It's comforting to know that our (feeble) Mommy is just like TW! And we agree, your stunningness grows exponentially. You have NO idea how many nights I've seen her go through this. Free food goes down easier LOL. Nice to read all about your writing with TW. Great answers. Have a marvellous Monday. Mom and I did this hop a few weeks ago and thought it was kinda fun confessing about how we do what we do. You just did it more STUNNINGLY than we did....totally. Great post CK. We love Ann too. Keep trying on her give-aways and eventually you will win something. That was fantastic CK, you are a talented one! Great post CK we learned a lot about how your TW helps translate your message! Oh CK! Of course my huskies would be gentle with you! We have 3 kitties at my house as well as my huskies! They all get along fabulously! MOL! CK, I hope that you can win one of my giveaways and soon! You could probably take on Shiner. Kitty Kitty Meow Meow always sliced up her snout with her claws. Shiner had nothing on her. I think it's pretty interesting how you went about starting your blog. Good idea to build yourself up on social media first. It seems like most peeps just try to jump right in with the blog first, but then they probably have no one to share it with. We love this answer? It's interesting to hear everyone else's writing process. We really enjoyed hearing about your process for posting on your blog, CK. TW sure is lucky to be able to work for a stunning cat like you! Hi sweet girl, Hope you had a good Monday. I had a great bomit! Don't miss tomorrow's post--I gots PICTURES! Hey--it's like a bomit FESTIVAL today--you, me, Katie Isabella and Mario that I've read about so far! We should all get together and plan this more often! You have talent, CK! Love your answers, your posts, and thanks for the cartoon, too. I do a lot of the same things, usually starting at 3 or 4 am. I have all the right motives, but somehow that one day turns into next week. Go figure. It's so easy to procrastinate, but you do manage to get your posts up and they're always good. You sure know how to crack the whip, CK!!! We've been enjoying your blog and your friendship for years : ) and it's always fun to read the inside scoop on how your stunning process works. CK, I need to take a few lessons from you! This mom of mine has been falling down on her job lately. I might just have to trade her in for another transcriber, BOL! That's a great post, CK! We got a real kick out of the cartoon and can certainly relate to it here!